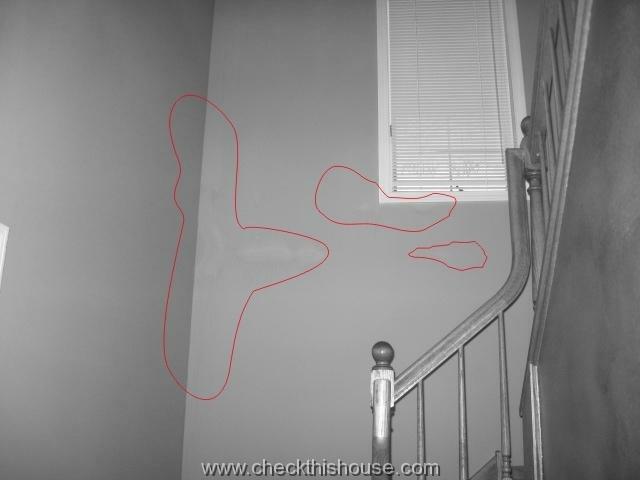 During my inspections, I have been asked many times about stains on walls, also called ghost marks, soot deposits / dust marks and water marks on walls interior surfaces. 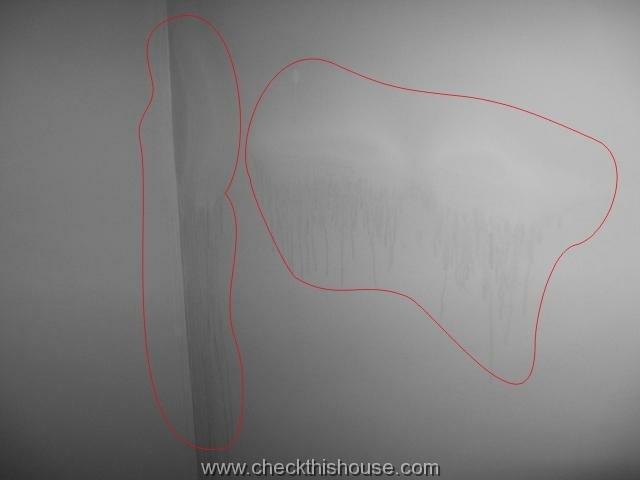 Since there was usually a mold concern in my clients’ questions, I’ll try to explain that stains on walls / ghost mark phenomenon. 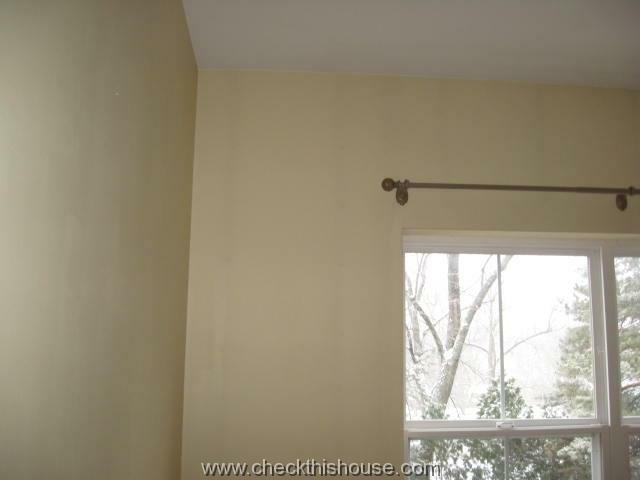 Are stains on walls a mold issue? 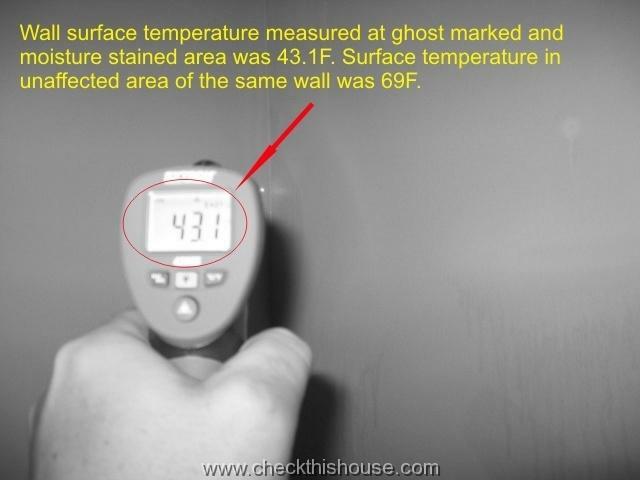 In most cases stains on walls including so called “ghost marks” have nothing to do with mold. However, if there appear to be water marks on walls, there’s moisture involved, and it’s detectable in the stained area (i.e. stained section covered with ice, surface condensation), there may be mold growing beneath the wall surface. There are a few factors responsible for those dark stains on walls and, sometimes, to permanently stop ghost marks from appearing on your house interior surfaces, you may need to take care of all of the issues. Particles of dust floating in the air stick more to cold than warm surfaces. Let’s see how this statement applies to ghost marks in our homes. The most annoying and noticeable dark stains on walls usually appear along the house exterior framing as straight lines on the walls and ceilings (especially cathedral ceilings). Sometimes they are back in one cold season, just after repainting. You can trust Mr. Einstein and assume that discolored areas are colder that the rest of the wall. You can also do a little experiment and slide the palm of your hand along the wall surface between the darker / stained wall area and unaffected one to feel temperature changing, sometimes significantly. Unless you have a surface thermometer, pick a cold day for the “manual” testing. I’ve measured temperature along those areas with stains on walls / ghost marks and clean sections during cold, winter days; and in some cases, there was almost 30F difference. Items 1 & 2 – Unfortunately, the only solution to prevent stains on walls and water marks on walls caused by missing insulation or insufficient amount of insulation is adding more. If it is in an accessible attic, you may be able to do it yourself – the most critical areas are along the wall / ceiling seam where the wall top plate is, so make sure that it is insulated. While doing it, don’t compromise attic ventilation by blocking soffit vents with insulation (install vent chutes / baffles instead). For exterior wall cavities, the cheapest solution might be to hire an insulation contractor and have him blow the insulation into the wall cavities. # 4. Correcting a problem causing stains on walls / ghost marks on the cathedral ceilings (without an accessible attic space above) could be more difficult. Blowing in the insulation will cause ventilation problems (like condensation and mold growth) in the roof rafter space. In some cases, the only solution might be the removal of the drywall / plaster / paneling, etc. and insulation installation. If the insulation is there, but there doesn’t seem to be enough of it, installation of another drywall layer would add an extra thermal barrier; make the interior surface temperature uniform – it may be enough to eliminate stains on walls, cold spots, and ghost marks. # 5. Stains on walls / Ghost marks on the metal framed walls are the worst to deal with. Since metal framing transfers temperature much faster than wooden studs (actually 300 times faster), the only solution would be to install foam sheathing over the metal studs. Try to do THAT on an existing home… It would be a huge mess. Stains on floors – If you see dark stains on carpet along the exterior walls, put your hand there. The area is usually much colder and you may feel some air drafts. So, once again, we have that cold spot / magnet attracting dust, plus carpeting acting as a filter for air being exchanged between the interior and exterior (or just between two different areas inside the house). Stains on walls – ghost marks around the pictures / picture frames hanging on the exterior walls – picture and frame act as an extra insulator creating small temperature zones, disrupting air circulation and attracting dust particles. 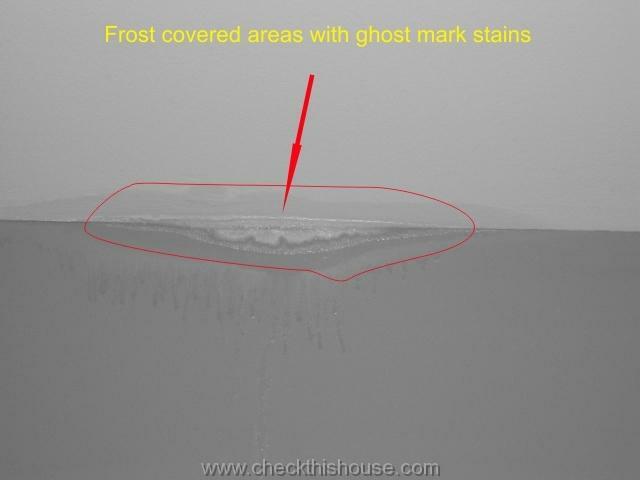 We just covered two stains on walls /ghost mark creating factors – cold and Mr. Einstein’s dust particle theory. However, there are many other components of our households (and beyond) responsible for creation of one more factor – black carbon, commonly known as soot. Soot is composed from microscopic particles, which are released into the air as a by-product of an incomplete combustion (fuel burning process). Any type of fuel we burn inside our homes is a potential source of soot; even the extremely popular scented candles (especially them) can produce significant amounts of soot. Since our homes become more and more air tight for energy conserving purposes, the air exchange becomes minimal and all that soot is being deposited in various areas of our homes creating stains on walls / ghost marks. Colder spots will be of course favorable, but areas directly next to the soot source will also become contaminated. You can take some simple steps to control stains on walls also referred to as “ghost marks” but in some cases the solution (especially if you noticewater marks on walls) may not be that simple. soot seems to be my problem. I have only electric heat, baseboard and storage units, but my wife burns many candles. The problem seems to me is magnified by my use of room humidifiers, is that posible? Would air pruifiers help? What works good to clean with? The soot realy shows up at nails on outside walls, and at the corners of outside walls where the trusses are. If soot deposits only appear in the spots you’ve described, it sounds like you have a house insulation problem. Even without burning candles, those areas would most likely become darker just from dust particles sticking to colder surfaces. Of course, soot from the burning candle flame accelerates “darkening” / appearance of ghost marks process. By using the humidifier, colder spots on walls will have slightly higher moisture level and soot / dust will more likely stick to that spot. Air purifying equipment should help to reduce amount of soot particles in the air, but not all of the purifiers are alike, so do some research before you invest several hundreds of $$$ in it. As for the clean-up process, depending on contamination, complete stain removal might not be possible. This 3 step method sounds promising – Soot sponge . In addition, check this article about candles, your wife may never use them again – Candle Soot Damage .